MU stock is near a better buy area but first could see further downside. Shares of large cap technology stocks, including those of semiconductor companies like Micron Technology, Inc. (NASDAQ:MU), thus far in 2018 have witnessed a notably more challenging environment than in 2017. While this increased volatility environment is bringing about challenges for the “buy the dip” crowd, for the more nimble and active investors this also brings about opportunity to trade the market in both directions. One of the nice advantages of using technical analysis as at least a part of stock market analysis is that it allows us to clearly define entry and exit points, i.e. both profit targets and stop-loss areas. It does not matter whether one uses trend lines, moving averages or something else from the technical analysis tool box … but what in my eye always markedly increases the odds of successful trades is to find trades where a multitude of technical “stuff” comes together to form so called support or resistance confluence areas. For perspective, let’s look at the the multiyear chart of MU stock. Here we see that after rising in a fairly orderly manner from 2016 through 2017, the stock went into vertical overshooting mode in February and March of 2018. As I often discuss in this here column, such parabolic moves are never sustainable at this rate and ultimately lead to corrective periods. Indeed MU stock began to top out in March and since has fallen nearly 30% from those highs. Active investors who want to express a view in the stock at this point may still find more opportunity on the short side for the stock looks like it could fall all the way to the lower end of the trading range (black lines), which also roughly matches up with the yellow 50-week simple moving average. On the daily chart, we see that MU stock for the past few trading days has found support in the blue zone around the $46 area that has offered both resistance and support since late 2017. The good part about this current juncture is that should the stock see further weakness, it has a well-defined next downside target at the red 200-day simple moving averages. This same target zone in the low $40’s also matches up with the lower end of the trading range on the above multiyear chart. As such, active investors and traders could now look to trade MU stock at $45.50 or lower to the short side with a next downside target at $42.50 while any strong bullish reversal on a daily closing basis would serve as a stop loss signal. 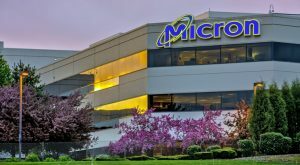 Article printed from InvestorPlace Media, https://investorplace.com/2018/05/trade-day-micron-technology-inc-mu-stock-heading/.